Taejongdae, a scenic spot renowned for its natural beauty, is a must-see destination during any excursion to the southern port city of Busan. 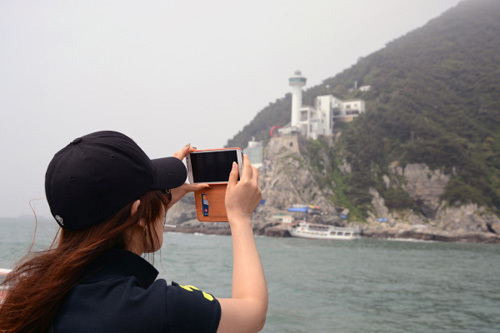 It was included in the Korea Tourism Organization's top 100 sightseeing spots last year as it boasts beautiful scenery, where pine trees stand in harmony with ocean cliffs and uniquely-shaped rocks. It was once called "sinseondae," as local myth has it that the area was once an enchanted place where reclusive hermits lived in peace. Ships depart from a wharf at the entrance to Taejongdae, and a five-minute trip takes visitors to a spot with breathtaking views of the coastal cliffs. These days, most of the visitors are foreign travelers. The boat ride takes around 35 minutes. 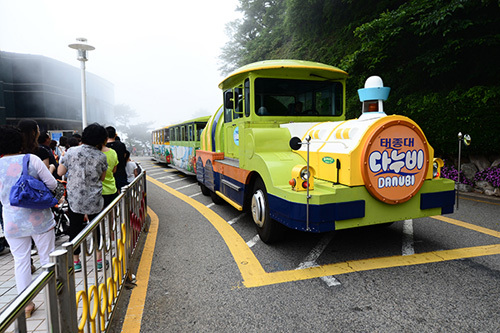 Afterwards, visitors can either walk along the 4 km circular road or take a mini-train to soak up more of the views. Tourists can hop on and off the train as frequently as they like. The first stop is a pebble beach populated with seafood restaurants. The sound of the pebbles washing against the tide adds to the ambience. 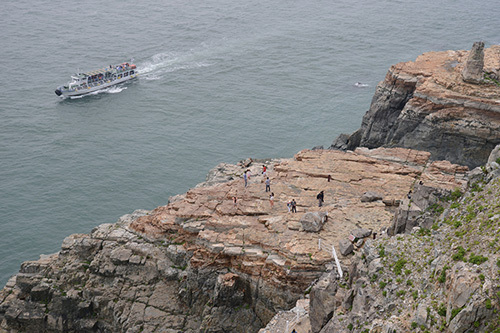 The next destination is an observation deck at an elevation of 250 m. Daema Island, about 56 km away from Busan's coast, is easily visible on a clear day. 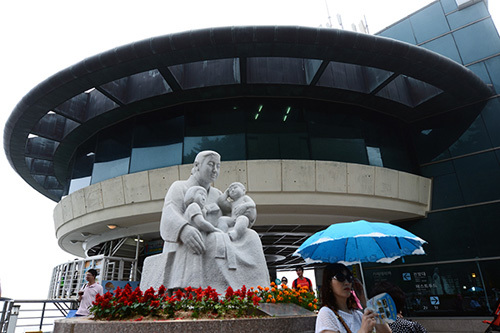 On the deck, visitors can see a sculpture of a mother hugging her two kids. This image of maternal love was erected to give courage to any lost souls who find themselves drawn to the cliffs' poignant beauty. 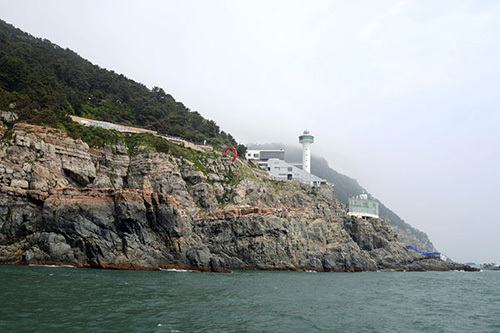 Another popular spot is the lighthouse in Yeongdo that dates back over 60 years. A small pathway leads visitors to a giant rock where the fossilized footsteps of dinosaurs were recently discovered. 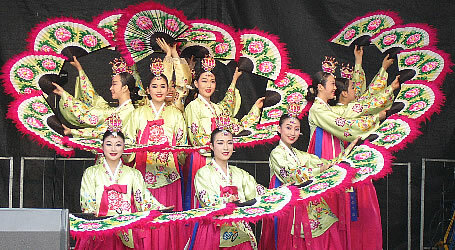 It takes about 90 minutes to stroll around Taejongdae at a leisurely pace. Time permitting, a trip to see some pillar-shaped rocks at a small coastal town in neighboring Ulsan is also recommended. Formed by boiling magma that pierced the surface of the earth's crust some 20 million years ago, they are called "hwaam" (flower rocks) due to the floral patterns that can be seen in their cross sections. The area serves as a natural museum that keeps traces and records of geological features including multicolored strata and the fossilized footsteps of dinosaurs. 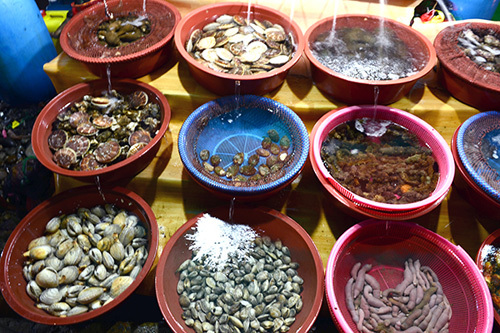 Another popular tourist destination located nearby in South Gyeongsang Province is Hallyeohaesang National Marine Park, the nation's first marine park. The 71 deserted and 29 inhabited islands look like jewels scattered over the sea, creating some of Korea's most spectacular ocean views.